If you want to be close to the centre and beach of Playa Blanca, Villa Conil is the ideal choice! A selection of shops, restaurants and the beach are around 10 minutes' walk away. What's more the fashionable Rubicon Marina is less than 30 minutes' walk along the seafront. The villa is homely and bright and with a private swimming pool makes a great choice for a relaxing holiday. Air conditioning/heating in the bedrooms and lounge, pool heating and WiFi are included. Set in one of the most desirable areas, this homely villa is a real gem in Playa Blanca! The walls add some privacy to the outside area where the private swimming pool is located. There is also a shaded terrace along with a dining table and chairs and a brick BBQ - great for enjoying alfresco meals. There is a parking area for your hire car. A pathway leads to the front door. The front door opens into the dining area with a table and chairs for 6 people. A door leads to the lounge with comfortable seating, a coffee table, flat screen TV and the patio doors to the shaded terrace. The well-equipped kitchen is adjacent. The double bedroom with an en suite shower room has patio doors to the private shaded terrace with a small table and chairs which are perfect for that early morning coffee or evening night cap. Completing the sleeping arrangements there are 2 twin bedrooms which share the facilities of a separate bathroom. 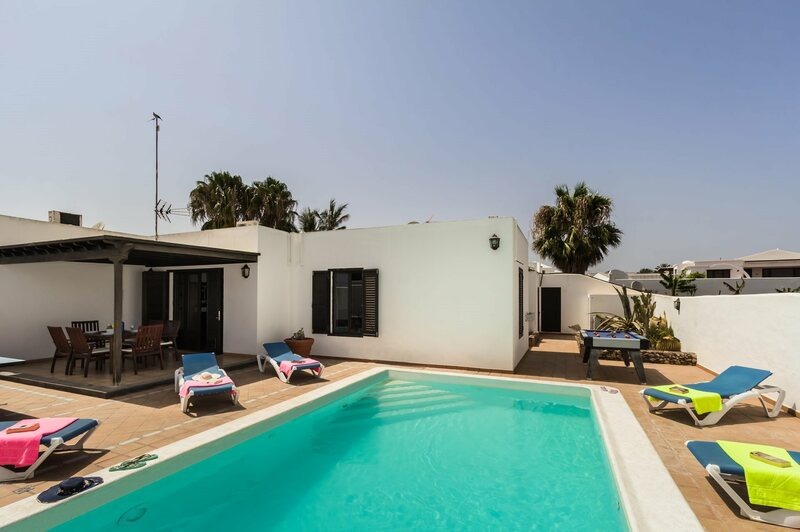 Villa Conil is a semi-detached property situated in a residential area of Playa Blanca. It's around 10 minutes' walk from the resort centre with plenty of shops, bars, restaurants and the beach . There is also a coastal promenade which runs from Faro Park to Los Coloradas passing the harbour. The lively Rubicon Marina is 5 minutes by car where you can also visit Europe's first underwater museum or indulge in some shopping therapy. Our Villa Calamare is next door. The town centre of Playa Blanca has a pedestrianised street with many high-street shops and smaller boutiques, 10 minutes' walk away. For more select shopping head to the Rubicon Marina with its designer shops and a twice weekly market Wednesdays and Saturdays from 09:00 until 13:00. Just a 10 minute walk from the villa, there are restaurants offering varied menus to tempt every palette ranging from Chinese, Indian and Italian to typical Spanish and tapas. In the fashionable Rubicon Marina, you can find an array of restaurants with great views of all the luxury yachts moored up. Alternatively, there are local restaurants in the harbour. The nearest beach to Villa Conil is Playa Blanca, which can be accessed on foot in 10 minutes. The resort does have several excellent beaches, all easily accessible within a short drive. The Papagayo Beach is totally unspoilt with its white sand and it is a great place to enjoy the volcanic landscape in the background. The Aqua Lava Waterpark has lots of water slides and is 5 minutes' drive away. Rancho Texas is by day an animal and splash park with birds and creatures from all over the world, including white tigers and crocodiles. By night, twice a week, the place comes alive with cowboys and Indians at the country night BBQ with line dancing, a great fun day or night out for the whole family. Alternatively, Lanzarote y Caballo has a small petting zoo and this is a great place to ride horses...or even camels! Lanzarote is a popular golfers' choice with, with good weather all year round. A pitch-and-putt course is available in the Hesperia Hotel in Playa Blanca. There is also an 18-hole golf course located behind Puerto del Carmen and a more established course in Costa Teguise, located on the East Coast. Lanzarote is also a great destination for activities such as cycling, hiking, wind surfing, surfing, and water sports. Or, a day trip to Fuerteventura is easily done for those who want to experience a second Canary island. Villa Conil is not available to book for season as it is sold out. Take a look here at the Lanzarote villas that are currently on sale. Overall we had a fantastic holiday - great location, security, customer service and outside space excellent. Thank you. Villa was lovely & private, clean & walking distance to all shops & restaurants. There is also a supermarket that delivers. Would use this villa again. The whole holiday was good and your reps were very helpful. Villa Conil was very well located only a short walk to the resort centre. The villa was equipped and furnished to really a good standard. The outside area was most attractive with plants and fabulous sunbathing area around the heated pool. We would love to holiday at this villa again as we found it most relaxing.